Last month, WeChat landed at Comic-Con Hyderabad where we announced the winners of the WeChat Sticker Challenge and celebrated ‘World Sticker Day’ in India. At Comic-Con Hyderabad, over 10,000 people came to experience all the fun at the WeChat booth and posed for photos with popular life-sized local stickers: Nautanki Baba, Mona, Jabbar, Narad Muni & Bong babe. The winners of the WeChat World Sticker Challenge were also announced after thousands of students across the country participated and submitted their creative designs. And the Grand Prize Winner is…. Congrats to Our Share-A-Scare Winners! Thank you to all the WeChatters who joined the Share-A-Scare contest. We received a huge number of submissions from Singapore, Malaysia and the Philippines and absolutely loved all your spooky Moments photos. Here’s a peak at some of the top scary sights this Halloween season. It’s Halloween, which means it’s time to show off your creative chops by posting a picture of your frightfully awesome Halloween costume on Moments. For Malaysia, Singapore and Philippines users, the greatest costume will win an iPhone 6 Plus and runner-ups will receive Petrol or Starbucks gift cards. The top entries will also be compiled and shared with the global WeChat community on the Chatterbox blog and Facebook to fright and delight WeChatters all around the world. Don’t have your costume picked out yet? 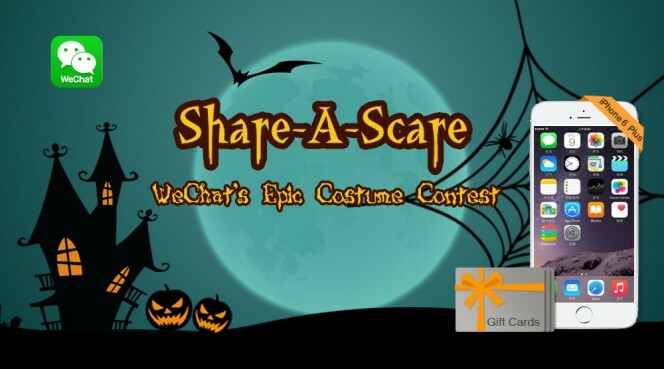 We have got just the WeChat sticker inspirations you need to find the perfect get-up this Halloween season. Meet Taylor McEnery, a 20-year-old aspiring model from Chicago, whose dream is about to become a reality. She will be walking in renown fashion designer, Vivienne Tam’s show at New York Fashion Week tomorrow as the winner of our Next International Supermodel Contest. The world will see her strut her stuff on the catwalk wearing pieces from the designer’s new Spring 2015 line. This February, WeChat and Vivienne Tam announced the fashion meets technology partnership to connect both designer and fans for an event as exclusive as New York Fashion Week. Fans could chat with Vivienne by following her on WeChat (VTamFashion) and receive an inside look at her design process. Not to mention, the audience of her Fall 2014 show used the app’s group chat feature to discuss the collection as it walked the runway. 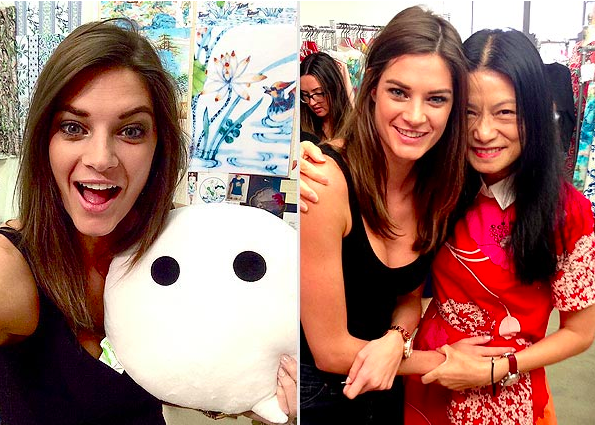 For the Spring 2015 NYC show, WeChat and Vivienne Tam took the theme of connection to the next level with the Next International Supermodel Contest. Super girls from around the world were invited to download the app and submit their application. Vivienne then selected the top three finalists and opened it up for the community to vote. Picture yourself walking the catwalk at New York Fashion Week in September with lights shining and photographers clicking pictures of you wearing the most coveted styles. For one lucky super girl, WeChat and world re-known fashion designer, Vivienne Tam, are turning this dream into a reality. Aspiring models can simply apply for this once-in-a-life-time opportunity by downloading WeChat and visiting the Next International Supermodel Contest site. To launch the contest, we chatted with Vivienne about her world of high-fashion and what she’s looking for in the next “It” girl. Check out the interview below. (From left to right) Vincent Wang, Assistant General Manager of International Business Group, Tencent Holdings, Y E Leong, Business Development Director of WeChat Malaysia, local celebrities – JJ, Yumi Wong, Adam C, Adrian Tan; and Louis Song, Country Manager of WeChat Malaysia and Singapore. There are some of us who have an undeniable need for speed. But you don’t always need to ground the gas pedal and hit law-breaking speeds to feel adrenaline cursing through your body. That’s why WeChat has launched WeChat Speed. To celebrate this exciting game in Malaysia, we pitted the nation’s speed demons against celebrities to find the fastest racers. WeChat invited everyone across Malaysia to compete and post their highest WeChat Speed scores for a chance to race with the country’s hottest celebrities in the grand finale.